‘Goa’, conjures images of romantic beach wedding venues, lazy relaxed breakfast brunches, scrumptious sea food, music and dancing by the beach. Often referred to as the Rome of the East, Goa offers some of the most spectacular and unique marriage locations that you can ever come across. You can select from the exhaustive list of luxe 5-Star hotels, ultra-stylish banquet halls, open-air wedding lawns, destination wedding resorts or private villas that can be exclusively booked just for wedding functions and ceremonies. Considering the venue location, guest accommodation, surrounding, party areas and several other dominant factors, we present to you the 7 most distinguished and highly regarded wedding venues in Goa. With this insider wedding planner qualified list, planning a destination wedding in Goa will be as easy as a seabreeze! 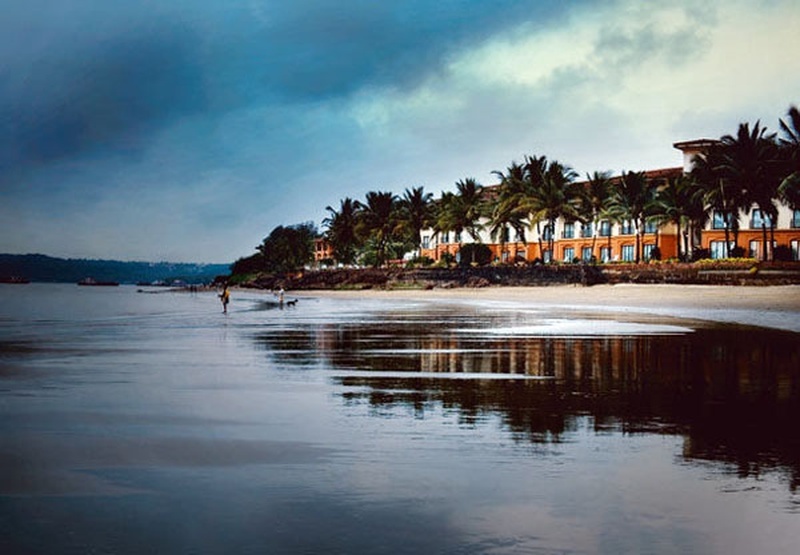 Surrounded by coconut palm trees, Prainha (known as little beach) is located in North Goa’s Dona Paula. For all the romantics out there, this place is a haven to take saat pheras or exchange rings. The impressive lawn area is perfect for a sunset wedding and can accommodate up to 100 guests. If you want a small intimate wedding by the beach, then you should definitely consider this place. It has 40-45 rooms including mini sea-facing cottages for accommodation. The Beachcomber restaurant offers some mouth-watering salt water delicacies and Goan specialties that you can relish on your wedding day. Ideal For: Pre or post wedding pool party or a beach wedding. With lagoons and gardens that spread across 45 acres, Park Hyatt in South Goa is the most amazing 5-Star hotel to host your wedding day. This venue overlooks the Arossim Beach and has a chic indoor ballroom and a scenic beachfront lawn. You can organize a variety of wedding functions and ceremonies that truly reflect your personality and style. It provides the best accommodation options including 200-240 rooms with well-equipped facilities for guests. You can also customize a special wedding menu with the help of a professional team of Executive Chefs. If a top of the class five star wedding is on your wish list, then this venue has the makings of your dream wedding destination. Ideal For: Destination wedding for a large guest list, Stylish high end destination wedding or cocktail Parties. As cool as the name sounds, this sea-front venue is an award-winning restaurant located at one of the longest beaches in Goa-Utorda. If you are planning a quick one-day wedding followed by a post-wedding party by the beach, then this is the venue that you should absolutely go for! The spectacular lawn area accommodates at least 200-250 guests at once and is best for open-air wedding functions or events. Rest assured about the quality of food as your menu will be looked after by an award-winning team of chefs. This wedding resort is situated in North Goa and truly provides a blissful atmosphere to any event hosted in its premises. The venue has multiple banquet halls (4 of them) with sophisticated architecture, admirable chandeliers, elegant interiors and modern décor. These areas can be dedicated to different wedding ceremonies and functions. With comfortable accommodation options (100-120 rooms) for your guests, stylish poolside area and a cool beachfront fine-dining restaurant, this is one venue where you are guaranteed to have a heck of a time. Ideal For: 3 day wedding with mehendi, sangeet, reception or theme night. Facing the picturesque Vagator beach, Thalassa is located on the hill-top and has a very beautiful banquet hall. This wedding venue with its charm and peaceful environment will add a charismatic appeal to your special day. If your guest list is around 150-200 and you are smitten by the thought of exchanging garlands on a cliff top surrounded by the glorious waters, then bingo! This is the venue for you! Rooms are available at the venue for a small party of guests, the brides and grooms and their respective families. Of course there are various lodging options available in and around the area for the rest of your wedding entourage. Key Feature: Hill-top view, Greek-style restaurant. This fabulous destination wedding venue is situated in Panjim, Goa and is most suitable for folks who want a big fat Indian wedding. With indoor banquet halls and outdoor area to choose from, the venue lets you to organize anything—from a beachfront wedding to various marriage functions and ceremonies. Perfect for a stylish cocktail party or a barbeque mixer right before the wedding to break the ice, this venue will customize functions according to your wedding whims. You can also have your guest stay at the resort, as the venue provides 125-160 rooms with exceptional interiors and awesome outdoor views. Key Feature: Poolside bar (Gazebo), seafront multi-cuisine restaurant (Coconut Grove). Ideal For: Big fat Indian wedding, destination wedding. Keeping the best for the last! Add a tropical touch to your wedding celebrations by choosing Coco Shambhala—an ultra-luxurious venue with four outstanding villas situated in Nerul, North Goa. Each private villa is unique from the other and offers distinct features and facilities. If your guest list revolves around 60-80 then this is probably the best wedding villa you can book. You can decorate the outdoor area with interesting wedding themes. All the four villas have to be rented together in case you are planning to tie the knot here. But with the ‘Garden of Eden’ feel to your wedding, it’s just worth it!